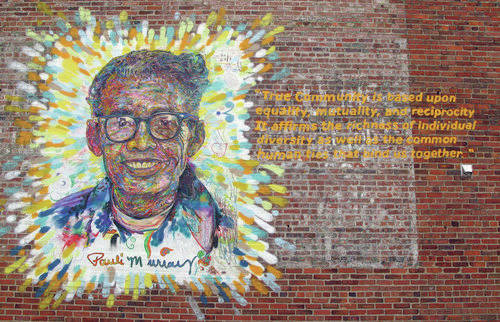 An example of Brett Cook’s artwork is this mural of poet Pauli Murray, part of the Face Up project in Durham, North Carolina. A mural project for Delaware was outlined in a community dialogue at Ohio Wesleyan University’s Richard M. Ross Art Museum on Tuesday. The couple dozen people who attended the information session got to see examples of the work of artist and educator Brett Cook, whose work has appeared in the Smithsonian’s National Portrait Gallery. First, Cook asked the audience to take three deep breaths. Doing so was a collaboration, which he said is how he works. Cook then asked people to write down what they thought of when they thought of the word community. Next, examples of public displays of art were shown, including sculpture, murals, advertising billboards and graffiti. Cook combines these elements in his contemplative, collaborative works. Cook showed brief films of two of his better-known works. The Face Up Project in Durham, North Carolina, features 14 permanent outdoor portrait murals with quotes from a diverse group of people in the community. The 2008 project has outlived some of its participants, and it is popular enough to be featured on bus tours, and maps have been printed so people can find each publicly-accessible work. In 2012, Cook had a six-week residency in Nigeria as part of a U.S. State Department initiative. With community involvement, he created a large outdoor mural of five people holding each other at the University of Lagos. Cook said the art also serves to transform the people who participate in the projects, helping them to heal and become whole. Fletcher said she hoped the two local murals would be up next spring and summer. She said Cook was currently identifying sites in downtown Delaware and elsewhere for the works. According to OWU, Cook will partner with the Ross, site owners, the City of Delaware (public art honoring the city’s history is described in the master plan), and the community to develop the works. The project is supported by the Ross, Ohio Arts Council, Delaware County Board of Commissioners and private donors. If you are interested in taking part in the project, please sign up at ramuseum@owu.edu. For more information, also visit www.brett-cook.com and www.owu.edu/ross.